Flats are fall's must-have shoe. From ballet flats to d'Orsay flats to cap toe flats, you can't go wrong with a stylish (and may I add comfortable) pair of flats. Here are a few of my favorite pairs and how to style them. The cuffed length of the boyfriend jeans makes them a perfect pairing for these ballerina-inspired, blush colored flats. Keep the hem high to be able to see the criss-cross, lattice details of the flats. The vibrant shade of blue not only pops but it also adds a bit of drama to the neutral colored denim. Forget that "no white after Labor Day" rule. It's archaic. White is perfectly acceptable year round. Pair your favorite white jeans or pants with a pair of plaid d'Orsay flats for a balanced look. I love the combination of black and red together. This shoe takes it one step further with a splash of animal print, which ties that black denim and the shoes together beautifully. 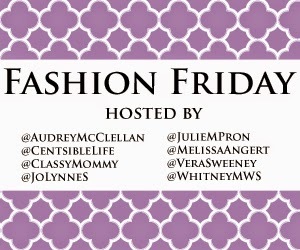 For more fall fashion inspiration and ideas, visit the Fashion Friday linkup.